I love rough-and-ready amber fragrances. I'm not a fan of dainty or too-sweet (polite) amber perfumes (except in soaps or candles, and even then...). Masque Milano's Tango1 is my type of amber; it presents a spicy amber that's singed around the edges. The perfume begins with the aromas of pepper, charred cardamom and "tempered" cumin (as I sniff, the color that comes to mind is rich sepia). While remaining dark in character, Tango's heart has glimmers of floral notes ("simmered/reduced" rose and jasmine...warm and rich, not fresh or clean). As Tango develops, I smell leather, tough musk, and only mild sweetness (tonka, vanilla, benzoin and clover accent the richer, burnt/caramelized notes; they never take over the composition). Tango plays an interesting trick: its diffusion is creamy and smooth, but the closer you get to the fragrance on skin the wilder/drier in character it becomes; you may feel you're wearing a smoking, almost-burning combination of amber perfume notes, but those around you will think: 'what a delicious "classic" amber fragrance.' Here's the scenario that's played out for me several times: "Kevin, you smell wonderful!" Then, after I let my admirer sniff my skin up close: "Uh...wow...that's not what I'm smelling...is it?" Two perfumes for the price of one! If you like Serge Lutens Ambre Sultan or Tom Ford Private Blend Amber Absolute, give Tango a try; it's one of the few amber perfumes I'll wear in summer weather. Luci ed Ombre2 goes on fresh, almost like the scent of a cool, spring rain shower; this clear/wet, citrus-ginger zing dissipates quickly as creamy white flowers (a tuberose-jasmine mix) take over. Next up is a diffusion of all that came before: a sweet white floral-ginger-(coconut?) infusion that would mix well with ice-cold vodka. Shall we name this cocktail The Veronica Lake? (Luci ed Ombre has a retro vibe.) Unlike the unisex, dusky Tango, Luci ed Ombre is feminine (and blond) in character; its "incense" note shows up hours into the dry-down and is silken and light, not at all smoky or ashy. Masque Milano Tango and Luci ed Ombre Eaux de Parfum have excellent lasting power and sillage; they are available in 100 ml: Tango ($240), Luci ed Ombre ($215). For buying information, see Masque Milano under Perfume Houses. 1. Tango: perfumer Cécile Zarokian; fragrance notes of black pepper, cardamom, bergamot, sambac jasmine absolute, cumin, patchouli, Damask rose, vanilla bean, tonka bean, benzoin, musk, leather, amber accord, melilot absolute (sweet clover). 2. 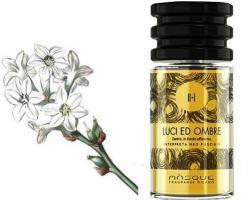 Luci ed Ombre: perfumer Meo Fusciuni; fragrance notes of incense, ginger, tuberose, jasmine, moss, patchouli, cedar. Note: images via Wikimedia Commons: amber, tuberose [altered]. Thanks for the review, Kevin, I LOVE their Tango and Russian Tea, now I’m going to have to try Luci ed Ombre. Your review of Tango is right on, exactly how I experience it. Flannery, you’re welcome…Tango is my favorite from the line. I am very curious to try these, especially Tango. I only have a sample of Russian Tea at the moment, but I like it a lot. Annikky…I’m getting LOTS of raspberry in Russian Tea…are you? I do get the raspberry, but it’s more like raspberry jam, if this makes any sense? Thank you for the review–Tango, Russian Tea, and Montecristo all sound sniff-worthy. OK, you and Angela have convinced me I need to sample this brand! I’m always grateful when NST highlights a brand that is worth trying. I can’t keep up with the new brands anymore, let alone the new perfumes, so I have to prioritize. When Kevin likes something, one does feel a sense of excitement. Donnie…ha! That puts the pressure on! Noz…we can’t keep up either…took me two years to try these! If i already have Ambre Sultan, are they different enough to need this too? Rictor…don’t think you’d need both.